Entry fee: $6 for each fleece for show or for sale. All entries must be postmarked by June 2, 2017. For entries post-marked after June 2, 2017, the fee will be $12 for each fleece for show or for sale. No refunds. All fleece must be entered in the name of the producer. An agent may enter and retrieve fleece with a letter from the grower. The show clerk will not accept mailed fleece. Intake will begin at 1pm, Thursday, June 22. Fleece will be accepted for entry on Thursday and Friday at the clerk's discretion. All entries must be in place by 9am Friday. Judging begins 10am Friday. The wool sale for Class 00 also begins at 10am Friday. Awards: ribbons will be awarded through 6th place. Prizes will be awarded for Champion and Reserve Champion Natural Colored and White Fleeces. The perennial Black Sheep Cup, sponsored by the Black Sheep Newsletter, will be awarded to the winner of the Five Most Valuable Fleeces for Handspinning from a Single Producer. To be considered, growers must enter Class 32 and pay a separate entry fee of $10 (one fee, not per fleece). A 10% handling fee will be collected on all fleeces sold at the wool and mohair sale. All unsold fleece must be claimed by the producer or agent between 3:30–5pm Sunday, June 25, 2017. All fleece left behind will be destroyed. All show fleeces will be judged on the basis of handspinning quality and character, stressing cleanliness, strength and uniformity. A fleece for show and sale must be properly rolled and placed in a clear plastic bag to be presented for show. No tied fleeces. Mohair fleeces do not have to be rolled. No fleeces with mothballs will be allowed in the show. Please air your fleeces extensively, as some people are extremely sensitive to these chemicals. The show chair reserves the right to eliminate these fleeces from the sale and show. The BSG Wool Show is a handspinners' show. Handspinning characteristics of the fleece are the primary judging criteria. Judges reserve the right to carefully unroll fleeces. Fine wool fleeces may be rolled with paper liners to prevent sticking. Each entry must be tagged with a Black Sheep Gathering tag available at the check-in table. Clear plastic bags will be avail- able for sale. Sellers will receive a signed original receipt. 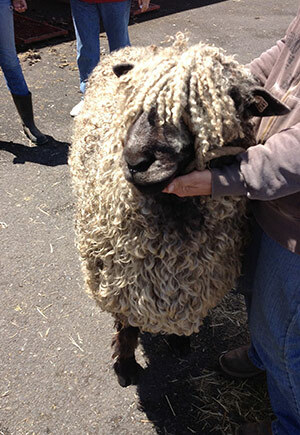 Participants are required to pick up unsold fleeces and must sign a release sheet at check out time on Sunday. If all fleeces have been sold, this may be done earlier as record-keeping allows. Participants will receive a check via mail for their fleece sales (less 10% handling fee), within 30 days of the BSG. Wool show judging is limited by time and space on a first-come, first-served basis. Please send entry form in as early as possible. Number of entries: Producers may enter up to 20 fleeces in the FLEECE SHOW except for Class 00 which has no limit on entries. Entries Per Class: Producers may enter 4 (four) fleeces per class. Wool, Mohair and Alpaca will be accepted for table sale (Class 00: FOR SALE ONLY). Class 00: the rule is "Buyer Beware" because they are not judged. However, many nice fleeces are entered in this class, and the BSG would like to continue to offer this marketing opportunity for producers. The committee chair, to maintain the standard of the show, will pull fleeces with wool rot or other extensive problems. Class 00: For Sale Only Fleeces – sale will begin on Friday at 10am. Promotional materials may be inserted in fleeces only after judging except for Class 00 which may be included at the beginning of the sale. 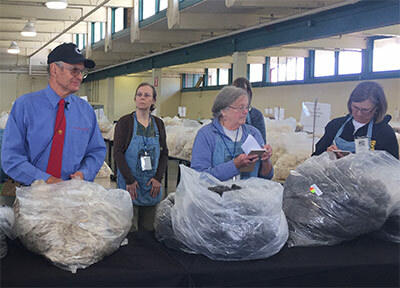 BSG Wool Show Committee Chair reserves the right to pull fleeces from the Wool, Mohair and Alpaca Show and Sale upon the recommendation of the judge in order to maintain the recognized high standards of quality handspinning fleeces. Fleeces with wool rot, abnormal "vegetation" or other disqualifying issues will be pulled with a note provided as to the cause. Please see the chairperson at the registration table with fleeces that are questionable. Judith MacKenzie has worked as a textile artist for many years. As a spinner, dyer and weaver, she has traveled and worked throughout North America and abroad. Judith brings a depth of knowledge honed by years of practice, scientific and historical knowledge, patience, humor, and hands-on expertise to judging that is unmatched. Whether she is assessing raw fiber, spun fiber, woven items, felting, knitting or other fiber creation, she teaches and inspires. Five Most Valuable Fleeces for Handspinning from a Single Producer. Each fleece will be judged on strength, elasticity, uniformity, breed characteristics, cleanliness and spinning quality. The exhibitor must preselect and indicate by an * in the class column, the five fleece to be judged. A $10 one-time fee is required. 00. For Sale Only. This class is not judged and there is no limit on the number of entries. Fleeces with wool rot or other extensive problems will be pulled by the committee chair. Alpacas and alpaca products will be located in Expo Hall #3. Alpaca fleeces may be entered in the show and sale. All entries will follow the Wool, Mohair and Alpaca Show rules and be judged on the basis of handspinning quality and character, luster/ brightness, stressing cleanliness, strength and uniformity. 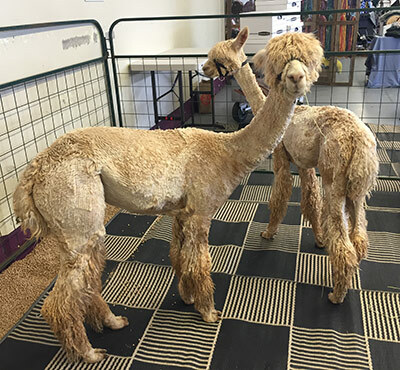 The Alpaca Association of Western Oregon alpacafarmsoregon.org will provide specialty awards for Judge’s Choice for Best hand and for Luster/ Brightness for each breed. Alpacas may also be entered in Class 00: For Sale Only Fleeces and Class 32: Five Most Valuable Fleeces for Handspinning.